The first time we did this, the inside was gooey!!! It was gooey!!! Brush the ramekins with butter. Dust ramekins with cocoa powder and tap out any excess. 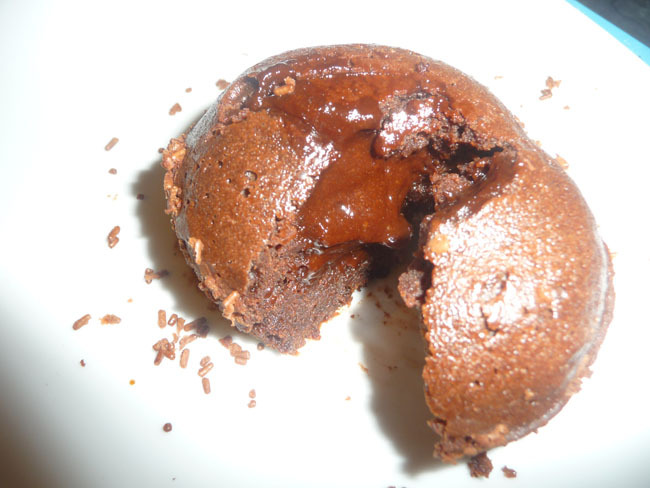 Melt chocolate with butter in a bain marie (heat proof bowl over a pan of simmering water). Wait for chocolate to cool a little. Combine sugar and flour in a bowl and add to the mixture and mix. Refrigerate for a minimum of a hour (to several days). Test with a tooth pick to see if centre is runny.